The express track to improve memory, reading comprehension, and super intelligence. Science suggests that the human mind has an almost infinite potential for learning and processing information. So why do you forget someone's name when you run into him at the store? Read an entire book and remember only pieces of it? Totally forget about a meeting you scheduled? Have a hard time remembering where you parked your car? Struggle to get through important information because you simply can't concentrate? Listen to a presentation and then promptly forget everything the presenter said? The problem is – and has always been – how to access the incredible power of your mind. Introducing "Advanced Learning Techniques" ... THE system you need to awaken the true power of your brain. In it, I team up with Colin Rose, best-selling author and founder of Accelerated Learning, to take you through the amazing techniques of accelerated learning. “Put simply, this is the BEST course I have ever seen to help you do so quicker, easier and in a more fun and relaxed fashion than the competition in your field, hence allowing you to achieve excellence and stay ahead for the rest of your life. When you master Accelerated Learning Techniques, your entire life improves. Put your brain on the express track to super-intelligence – NOW! 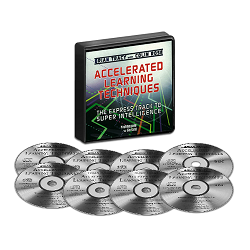 The Advanced Learning Techniques 6 CD set. The express track to super intelligence—the complete 6 step system—a total of 7 Hours. These tips and techniques are based on 30 years of my research and experience in 5 different fields, along with proven ideas and strategies I've used in my own multi-million dollar global businesses. You can implement these techniques immediately to make learning easier and faster, so you can earn more. 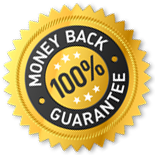 I'm so convinced this program will work, if you work it, I'm making it available to you at absolutely NO RISK. If you're not 100% convinced that “Accelerated Learning Techniques” has helped you learn faster, and retain more information over the next 365 days (that's 1 whole year), then simply tell us and return the product. We will issue a prompt and courteous refund (less S+H)—no questions asked. It's time to super-charge your mind – are you ready? "This program is an absolute MUST for any student of anything and any teacher of anything!! ESPECIALLY if you are a parent. Buy this program NOW!! Take two weeks to devour it. And have fun applying the ideas to anything you are learning. Do this one first!" Awaken the true power of your brain – and unleash its unlimited potential. It's there... all you have to do is learn how to use it. Order your copy of the "Accelerated Learning Techniques" program now! There is a need for a course in learning in every high School. The meta perspective on learning we get from Brian Tracy´s Accelerated learning is very good for everyone that studies something. This course should be an option for everybody that starts High School. It is essential for every learner to understand the learning process to be able to achieve their educational goals. Every disc was very helpful and really clear to understand. Learned so many techniques I had to write them down to remember them! $ and Time well deserved!!! The content covered is excellent. The value, wisdom, and knowledge shared is immediately applicable. The one thing this course did not offer was a workbook to follow the wealth of information that is shared. I was challenged to follow along the audio and keep up with notes along the way. The audio does not have a 15sec rewind option like many of the other high quality books and courses I study. This makes it very difficult to rewind and repeat some of the best material I've been exposed to (also Extremely time consuming!). I don't believe I would commit the amount of time to do this again.